You might think that the dry environment of Central Australia is an unsuitable place for frogs. But, in fact, there are quite a lot of frogs which are skilled drought dodgers and happily survive in the Australian deserts. They are generally small but absorb quite a lot of water and store it between their muscles and their skin. This gives them a round shape. Spencer’s burrowing frog (Limnodynastes spenceri) has half-webbed feet and smooth skin. The colour is variable but it has characteristic bars on its limbs. Burrowing frogs have digging implements on the side of their back feet. In dry times they dig down backwards into the sand in search of a moist spot where they can sleep until heavy rain awakens them from their slumber. A short burst of activity then follows. Up to the surface they climb, feed and reproduce before the water disappears. 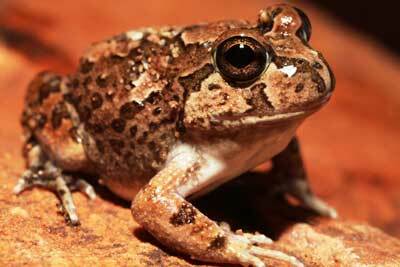 Spencer's burrowing frogs lives in the sandy riverbeds of Central Australia. Spencer's burrowing frog is an opportunistic feeder, eating whatever insects are available. Termites are a common food item because of their own breeding response to the same moist conditions which brings the frogs to the surface. They breed at any time of year following heavy rain. The males call day and night from the water: a soft deep call somewhat similar to that of a laying hen. A frog doesn’t chew its food but swallows it whole with its eyes shut. Its big eyes bulge out of its head but also poke down into the mouth. When the frog has food in its mouth, it pushes its eyes down several times to crush it. Then it swallows. The name amphibian comes from two Greek words: amphi (meaning double) and bios (meaning life). It refers to the way these animals live in two worlds. Frogs’ ears are like radios. They are tuned to the frequency of their own species while filtering out the calls of other species. Frogs don’t drink. They absorb water directly through their skin.